Portable shower benches offer a convenient way to safely and securely bathe while you are on the go. They can also be used as permanent, light-weight bathroom safety solutions in a pinch (Source). The 4.5 lb., Carex portable shower bench is a solid option. It is a one-piece portable shower aid that includes drainage holes so that water doesn't pool on the bench, rubber stoppers on the bottom to ensure that it doesn't scratch up tub surfaces, and fits to most standard-sized tubs that are 19" to 28" wide. The bench will brace against the tubs inside lip-and must be positioned on a level surface, so tubs that have too much of a curve on their lip might not work for these portable shower benches. That said, let's take a look at five of the best-selling portable shower benches on the market today and see how they compare. Often it can be difficult to stand in the bathtub while trying to take a shower if you are disabled, elderly, or injured. The Drive Medical Portable Shower Bench is a portable bathtub shower bench that users have found makes taking a shower a lot easier if you or a loved one is impaired. The bench is very portable and compact- extremely easy to store when not needed. Users like that it provides an effectively safer environment when taking a shower or a bath. Buyers also have commented that this portable bathtub shower bench is very sturdy and includes a strong handle that gives added support for more safety. The seat itself has drain holes that keep the water from pooling- another handy feature. This portable bathtub shower bench also has rubber stops on it on the bottom that helps to keep the user from getting scratched. The size is compact and measures 30.5 inches in length, 14.5 inches in width and the seat itself is 5 inches high. It can hold up to 250 pounds of weight safely. 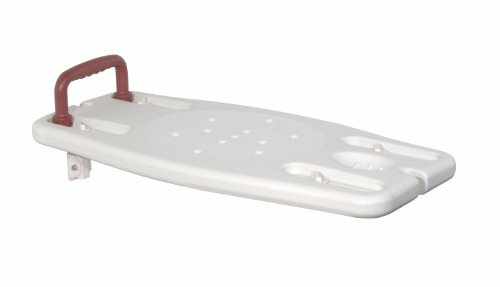 Those who have used it like how easy this portable bathtub shower bench is to install and remove from the tub when not in use. Even though this portable bathtub shower bench says it holds up to 250 pounds, some users have found that it didn’t really feel as if it could actually hold that much weight. This Sodynee portable bathtub shower bench can be used as both a bath bench or a shower chair. Users like how sturdy this portable bathtub shower bench is. They also enjoy the anti-slip seat surface, as well as the drain holes that the seat has, which allows water to drain out during a shower and bath. This portable bathtub shower bench also comes with slip-resistant rubber tips on the end of each of its four legs, which ensures that the seat will not slip in the tub. This makes it a lot safer for bathers to use. One feature that some users particularly liked is that this portable bathtub shower bench is actually adjustable- and it can be adjusted from a height of 13 inches to a maximum height of 19 inches. They also like that this bench can fit into most any size tubs and showers, including very small tubs. This portable bathtub shower bench can hold up to 250 pounds easily and safely. A few users did have issues with the legs of this portable bathtub shower bench being faulty- so be sure to test it out at first! This Carex portable bathtub shower bench is an adjustable seat that will fit most of your standard size bathtubs. Users like that you can adjust it anywhere from 19 inches to 28 inches in width, making it easy to fit their bathtubs. Reviewers also like how the seat of this portable bathtub shower bench is contoured for optimized comfort. There are also rubber stops that help to prevent a user from scratching the tub. 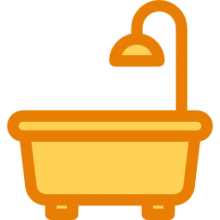 Many users like how easy it is to store and how convenient it is to take traveling- so that showers and baths are safer when they vacation. Most buyers commended the quality of this shower aid- however they did find it a little difficult to get it adjusted to fit the tub they were using at first. Also, some users found that this portable bathtub shower bench could not be used with certain styles of bathtubs with overly curved lips & edges. This Vive portable bathtub shower bench comes with a lifetime guarantee that helps people feel a lot better about the product since they realize it is backed 100% by the company. They also like how easily it fits on most standard bathtubs and that it can adjust up to 28 inches wide. The design of this portable bathtub shower bench is engineered for comfort and security. It also has drain holes in it to keep the water from pooling during a shower. The seat of this portable bathtub shower bench is very heavy duty plastic and will support up to 250 pounds. Users like that it has an easy to grip handle which helps its users maintain optimal stability when they are taking a shower or a bath. This portable bathtub shower bench is extremely lightweight and comes in one piece making it easy to take wherever you need. As well- it is easy to store when not in use. One other feature some users like is that it is extremely easy to set up on the tub and the legs that keep it in place are adjustable and easy to fit into the inside of the tub. The only complaint is that one really needs to measure the interior width of the tub or shower in order to fit this portable bathtub shower bench in properly. This Carex portable bathtub shower bench is a durable bench that users like for several different reasons. One reason is that this portable bathtub shower bench can hold up to 300 pounds of weight and it can also be used as a transfer bench and not just a shower bench, which gives it a dual functionality. They also like this portable bathtub shower bench because it can be easily adjusted from 19 inches to 28 inches in width. Users have found this portable bathtub shower bench pretty easy to use except for the fact that you might need to customize the shower curtain so that it fits better around the chair. Many users like that it is easily adjustable and the design is very simple and easy to install and remove, making it easy to store as well. However, some users have found that the tub needs a large edge on the wall inside the tub area to fit well and definitely cannot be used in a shower that has a door and not a shower curtain. Shower benches are important bathroom safety aids that fit across the tub enabling you to comfortably sit while you bathe. 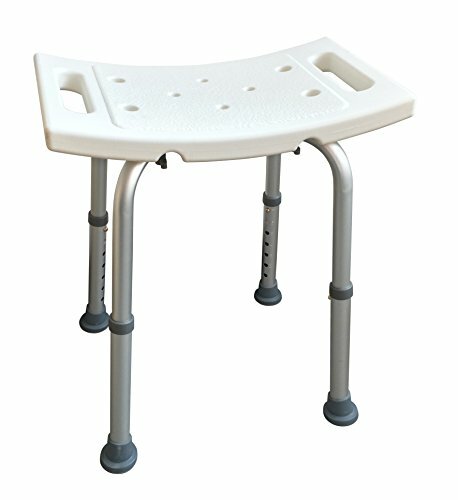 If you or a loved one are disabled in some way and find it difficult to stand for long periods of time, a shower bench, and particularly one that is transportable like those we have reviewed the above, can be an excellent addition to your bathroom to increase the comfort and ease of living that elderly or disabled relative. Additionally, sometimes people that have had surgeries, or are recovering from injuries make use of these shower bench seats- using them for an intermediary period of time until they are well enough to stand in the shower again. One of the primary benefits of portable shower benches is that they can be removed from the shower after use, or even pushed towards the back of the tub, so that they are out of the way but also accessible if you or loved one needs to use them again. Their contoured designs provide comfortable sitting surfaces, while their rubber grip treads ensure non-slip grips, making it a secure and safe way for the elderly or injured to shower securely. 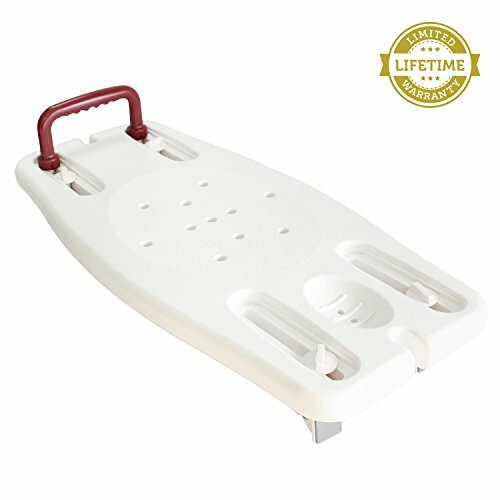 Some users that complain of having back issues, arthritis, and balance impairments as a result of autoimmune disorders described using their bath benches to shave their legs, often happy to use to use handled portable shower benches as a way to move the shower aid in and out of the tub. Another user cautions that when she used a shower bench with legs, initially she was pleased with it, but the legs of the bench actually gave way and collapsed even though she was under the advised weight limit- she advises that the wing nuts on the bench like needed to be tightened. Other users described purchasing portable shower benches for elderly relatives had surgical procedures-writing that they are pleased that the benches are lightweight enough that their elderly relatives are able to transport them themselves. We strongly advise that when you first install your portable shower bench that you tested first before putting your full weight on it- if you feel like it is insecure or doesn't grip to the tub strongly enough, by all means return it and figure out if perhaps a bath stool would be a better seating option for you while you bathe. As we have seen, portable bath benches are convenient, lightweight bathroom safety solutions for disabled, elderly or injured individuals that need a safe and secure way to shower and clean themselves when standing for extended periods is problematic. If you were in the market for one of these portable shower benches, make sure that you read our reviews, examine our comparison table and generally take stock of all of the different bathroom safety options on the market today to get a sense of the best option for you and your family.